All of the designs on this site will use the following items so they will not be included on the list of materials. These necessary supplies include a ruler, a fabric tape measure, a good pair of craft scissors, double-sided tape, a pencil, and multi-purpose craft clue that will work on paper, ribbon and beads. All of these items can be found at your local fabric or craft store. These are essential items for wrapping beautiful gifts and should be included in your gift-wrapping supply box. Below I have listed a few of my favorite brands that I use for all of my designs. This is the only tape I used for my gift wrapping. I like to hide the tape under the paper to give the gift a more polished, clean look. I love this tool! I can quickly and easily cut precise sections of paper to wrap my gifts. These are great because they cut so smoothly. They come in 6", 7" and 8" lengths. I like to use the larger pair of scissors for cutting craft paper and the smaller pairs for ribbon and precision cutting. I use this glue stick to attach scrapbooking paper to my gifts, bags and cards. It is very easy to use and does not wrinkle the paper or leave lumps when it dries. I use this glue to attach fabric ribbon and bows to my gifts. It dries clear so it does not show though the ribbon. I use this glue to attach the beads and flowers onto my gifts. I only need to apply a small amount to the back of items. The tackiness of the glue allows me to position them exactly where I wanted without slipping. 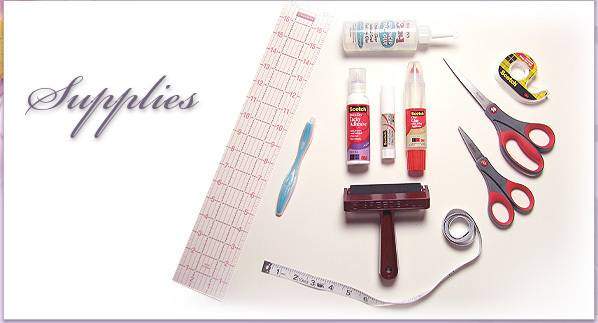 This ruler is great for measuring scrapbooking/craft paper. It is the perfect size for all gift-wrapping projects. The hard rubber brayer does an amazing job smoothing out craft paper after it has been glued onto gifts, bags or cards. It presses the paper on to the design to give it a more professional look. This glue not only dries fast, it attaches beads, ribbon and anything I have tried to my gifts. It also dries clear so it is very forgiving of mistakes.